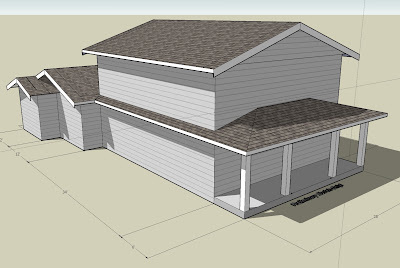 Here is a screenshot of our house model in Google SketchUp. If you follow the links in the previous post you can install it and load up our house. Obviously this is an early draft - it's a bit hard to get into the house right now. Good to know that you like windows. Doors work well too! Seriously, the porch is great. Thanks for keeping the web site up. Your new home is looking great! Mom: I'm glad you like the house! You can probably tell that we're really excited about it. I can't wait until you can come visit us in it. You're supposed to have a title!